On Monday I was invited up to Manchester for a manicure at the Only Fingers + Toes Nail Beautique in Harvey Nichols. I can't remember the last time I had a proper salon manicure so I was really excited to go & see all the beautiful polishes that O.F.A.T. have to offer. Only Fingers + Toes have an ever-growing library of luxury 5-free polishes. They bring out new colours & finishes every season so their collection is always on trend. Their brushes have been designed to give perfect 3-stroke, long-lasting, lustrous coverage with ergonomically designed handles for maximum comfort & usability. They also have a comprehensive range of nail care products to ensure salon-style results and beautifully conditioned hands & feet. Their nail bar is tucked away in the corner of the ground floor of Harvey Nichols so the atmosphere is very calming. It is situated next to a couple of other treatment areas in the main beauty hall including the Umberto Giannini Hair Salon & Shavata Brow Studio so you could have a full-on pamper day here if you wished. The Nail Beautique has a white minimalistic design & everything looks very chic. The staff were all super friendly & made sure I had a really enjoyable experience. I had the Classic Therapy treatment which began with me choosing my nail polish. I went for Nitrogen from their Autumn/Winter Elements collection. 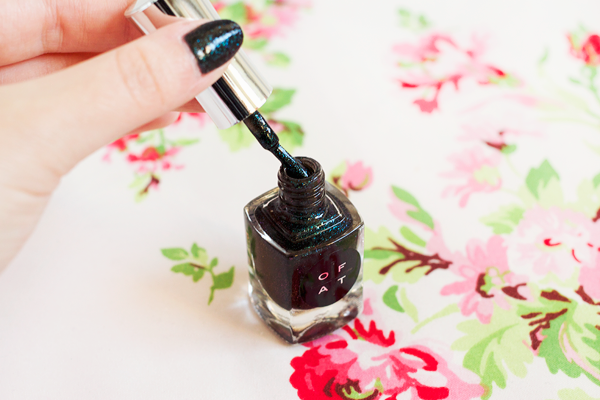 It's a deep, dark gunmetal blue with festive green sparkles. Their glitter polishes are absolutely stunning, all densely packed and multi-faceted. My nails were shaped and buffed to perfection using a glass file before my hands were placed into some gloves containing a warm keratin treatment. This was one of my favourite parts of the manicure because it just felt so lovely. Much like a keratin treatment for your hair, these keratin gloves help to promote nail growth & strength whilst making your hands feel unbelievably soft. 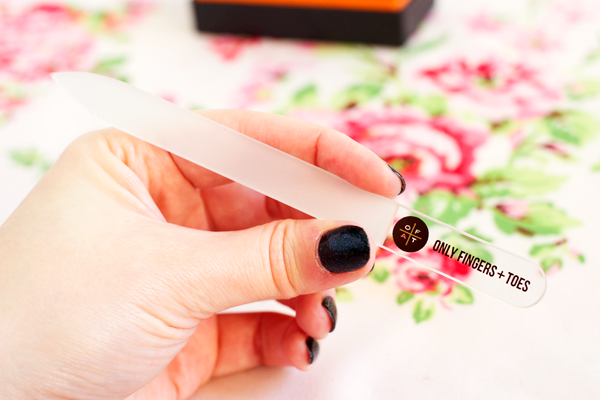 It also helps to soften your cuticles so that they can be cut & pushed back with ease. A stress melting oil hand massage followed which felt so relaxing. Then two layers of Nitrogen sandwiched between a base & a top coat were applied to my nails. My treatment was finished with some quick drying nail drops & some more oil around my cuticles. I'm so pleased with the manicure! The treatment was wonderful & I absolutely adore the polish I picked out. I struggle to find the time to maintain my nails properly so being able to leave it to a professional was brilliant. I'm thinking this might have to become a more regular occurrence! After my manicure I was kindly treated to a bottle of their Nitrogen nail lacquer & a glass nail file. In the bottle the colour is reminiscent of an oil slick but on the nails it looks more like a semi-matte black brimming with forest green glitter. Nitrogen is actually textured which is a really interesting finish and unlike anything else in my collection. A glossy top coat will smooth it over though if that's what you prefer. It's perfect for the Christmas party season, classy but with an element of fun. The formula of this polish is outstanding. It is completely opaque in two coats which is impressive for a glitter polish. I've had minimal tip wear with no chips whatsoever. It simply stays put. At £16 per bottle you definitely get what you pay for. 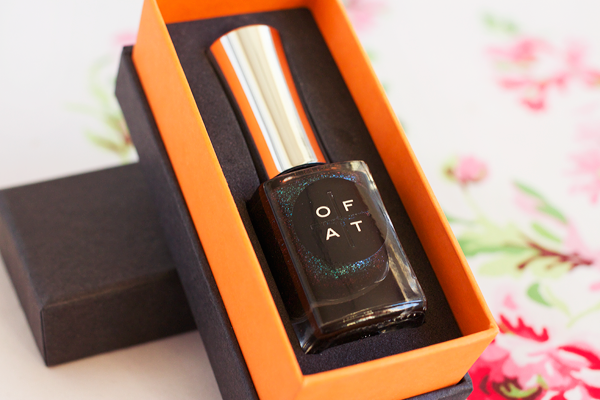 Each polish comes presented in this gorgeous little gift box which not only looks good but is 100% recyclable. Individually these polishes would make such amazing Christmas gifts but if you're feeling incredibly generous you can purchase a gift set of three, six or 24 nail polishes for your loved ones. The 24 polish gift set comes with a double layer of nail lacquers, just like a chocolate box! If there's a nail colour addict in your life then I can't imagine a better present for them. The Only Fingers + Toes range is available from Harvey Nichols stores nationwide & online, with professional treatments available at Harvey Nichols Manchester, Grace in Belgravia, The Private Clinic in Cheapside & their flagship salon in South Croydon. Oh my that polish is stunning. 0.0 Need in my life!